Obama Supporting Heirs of the Nazis in Ukraine | Stop Obama Now!! ← Is Obama Communist, Muslim or Something Else? Obama and his henchmen have supported the Muslim Brotherhood in the Middle East and it has been reported that the Brotherhood has deeply infiltrated his own administration. The Muslim Brotherhood were allies of the Nazis during WWII. The Grand Mufti of Jerusalem recruited three divisions of Muslims in the Balkans for service in the Nazi SS. Ukrainian nationalists also supplied a Waffen-SS division for Hitler’s use, called the Galizien (Galacian) Division. 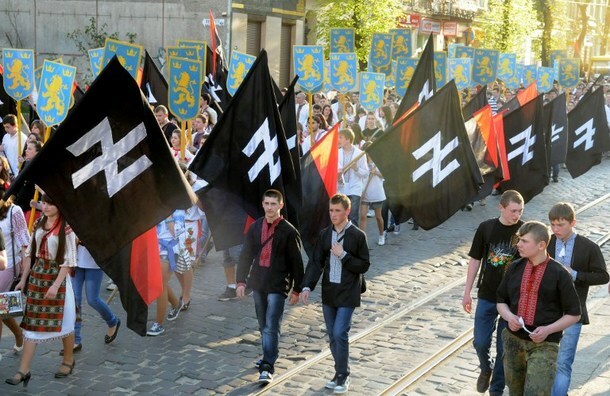 On the right, Ukrainians celebrate the Galizien Divsion, carrying flags with a common Nazi symbol, the Wolfsangel. Now, Obama and his quisling collaborators in the Republican Party, such as John McCain, are supporting a nationalist movement in the Ukraine that includes Nazi-like groups. Some of the worst atrocities of the war occurred in the Ukraine, with the active involvement of Ukrainian allies. In Lviv, Jews were herded together in the town square and Ukrainians were encouraged to bludgeon them to death with iron crowbars and other clubs. Malcolm X started collaboration between black nationalists and extreme leftist groups in the 1960’s, because he desperately needed allies at the time. Malcolm X was, himself, meeting with Nazi groups to discuss collaboration in the early 1960s. Groups such as Jeremiah Wright’s Trinity Church still honor this tradition of racialist black nationalism. There have been examples of cooperation between white and black racial supremacists from Garvey’s meetings with the KKK in the 1920’s until recent decades. Former KKK Grand Dragon and founder of the White Aryan Resistance, Tom Metzger addressed the New Black Panther party in the 1990’s and recounted this history of cooperation, saying both groups hate the current system (and want to bring it down). This just shows that the interests of the extreme Left and Right sometimes coincide against the Middle.